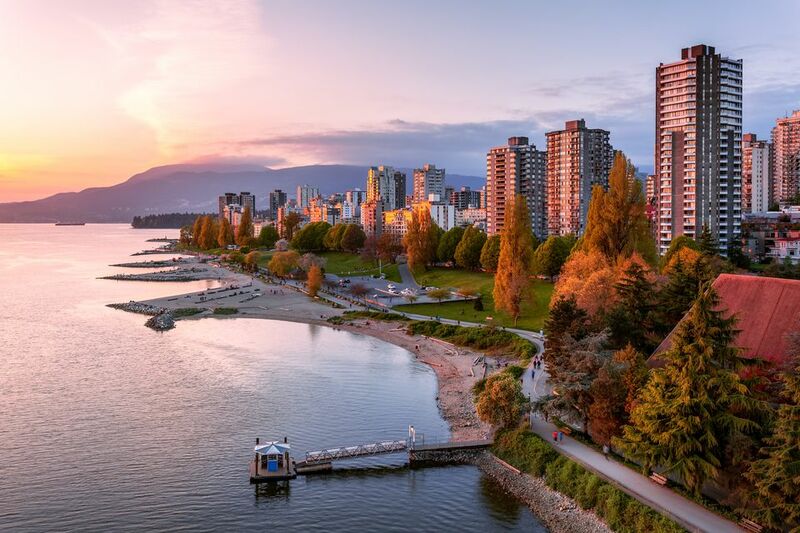 Famed for its beauty, Canada’s most cosmopolitan West Coast city sits surrounded by mountains and beaches, with the green expanse of Stanley Park’s forest enhancing the downtown peninsula. While the great outdoors appeals to travelers looking for adventure, Downtown Vancouver is packed with attractions, shopping, and dining making it a must-visit for any traveler to the city. There are four Vancouver neighborhoods in the downtown peninsula: Gastown/Chinatown, Yaletown, the West End, and Coal Harbour. Compact and easy-to-navigate, most of the neighborhoods are within walking distance from each other and the SkyTrain Canada Line rapid transit (Vancouver's metro) makes it easy to move around the city center. There are also hop-on, hop-off sightseeing tours and walking tours that will take you to all major downtown Vancouver attractions, plus Stanley Park and Gastown. From the Canada Line's Vancouver City Centre station, you can walk to Vancouver Art Gallery, the largest gallery in western Canada. It's close to Robson Square, a hub for free ice skating in the winter and free dance classes in the summer. Home to permanent and visiting exhibitions, Vancouver Art Gallery showcases international artists and British Columbian artworks by renowned Canadians such as the modernist landscape painter Emily Carr. Walk a few blocks to the Bill Reid Gallery of Northwest Coast Art, located at 639 Hornby Street, to see pieces by the prolific Indigenous artist and learn more about the people of Canada’s First Nations. Downtown Vancouver is the place to shop in Vancouver, in part because downtown Vancouver shopping is so diverse. And it's all within a three-block radius, making it easy to walk to each location. Robson Street Shopping offers a lot of brand name, mid-price fashion, including local brands like Lululemon Athletica and Aritzia. Pacific Centre Mall also offers brand-name fashion like those stores found on Robson Street, but it is set indoors, which makes it ideal for a rainy day. The Hudson Bay Company (The Bay) is a historic Canadian department store that sells everything from clothing and accessories to homeware—look out for "Bay Days" for special sales. Holt Renfrew is a Canadian, high-end department store that is highly recommended if you’re looking for something quintessentially Canadian to take home. Nordstrom Pacific Centre found close by at 799 Robson Street, opened its doors in 2015 to offer fashionistas a taste of the American high-end department store experience. Vancouver is a foodie city, teeming with incredible restaurants of every sort. The best restaurants in downtown Vancouver run the gamut from food trucks and izakayas (Japanese pubs) to seafood extravaganzas, and high-end Italian restaurants. The Vancouver Art Gallery plaza is a hub for some of the city’s most beloved food trucks such as Tacofino, which now also has several brick and mortar locations serving the popular burritos and tacos, and Mom’s Grilled Cheese Truck. Vancouver's famous Japadog’s, Japanese-inspired hot dogs, can usually be found nearby on Burrard Street. Download the StreetFood app to find out where and when the food trucks will be open, or just keep an eye out for the lines. Designed to resemble the cruise ships that berth alongside Canada Place, the white "sails" are a distinctive part of Vancouver’s waterfront. A stroll around the west promenade takes you along “The Canadian Trail” through the country’s 10 provinces and three territories. Watch the seaplanes take off from the nearby Vancouver Harbour Flight Centre terminal, or take a trip across the country at the high-tech FlyOver Canada ride. Buckle up and sit suspended in front of a spherical screen that creates the illusion of flying across Canada’s awe-inspiring landscapes from coast to coast during your eight-minute flight. Close to Canada Place and Waterfront Station, the 553 foot-high (168.60 meters) panoramic observation deck at the Lookout at the Harbour Centre is the perfect place to get a 360-degree picturesque view of Vancouver. From the snow-sprinkled mountains of the North Shore to grittier Gastown and the sparkling glass skyscrapers of Coal Harbour, the whole city can be seen from this unique vantage point. Take a tour or explore on your own and enjoy lunch, dinner or Sunday brunch in the tower’s revolving Top of Vancouver restaurant. Wander east from the Canada Line’s Waterfront Station to reach Gastown, Vancouver's most historic neighborhood. Wander down Water Street and Gastown’s cobbled streets to check out local fashion labels in bijou boutiques such as OAK + FORT, a Vancouver-based, minimalist clothing brand that has stores across Canada and in New York, and Six Hundred Four—a sneaker company that features ever-changing artwork on limited edition runs of shoes. Eccentric Canadian shoe designer John Fluevog’s flagship store and design studio can be found in the heart of Gastown, selling Art Deco-inspired footwear. Stroll down Gastown’s illuminated streets at night to experience the top Gastown restaurants and make time for a pre- or post-dinner drink and become a cocktail connoisseur at one of the neighborhood’s many bars. Try the Pourhouse for classic cocktails, L’Abattoir for crafted concoctions, Clough Club for cool surroundings or The Diamond’s secret back bar for speakeasy-style sips. Bordering the edges of Gastown, Chinatown is a colorful neighborhood where you’ll find stores selling authentic Chinese ingredients, as well as trendy bars and artisanal coffee shops. The Dr. Sun Yat-Sen Classical Chinese Garden is a walled garden that is just a short walk from Waterfront Station and Gastown. This tranquil oasis was opened in the mid-1980s and was the first authentic Chinese scholar’s garden ever built outside of China. The garden often appears in film and TV shows, doubling as a location in China, thanks to its traditional-style house, pond, and cherry trees. Explore the free public park section of the garden (perfect for pictures) or learn more about the garden’s Feng Shui and Taoist principles in the museum area (with an admission fee). Chinatown is home to restaurants inspired by all corners of the globe, from handmade pasta at Ask For Luigi, to Southern comfort food at Mamie Taylor’s and Latin American dishes at Cuchillo. Modern Asian fusion food can be found at Sai Woo, Bao Bei, and Kissa Tanto. Start your night with contemporary cocktails at the Chinese apothecary-inspired The Keefer Bar or the retro Las Vegas-style Emerald Supper Club & Cocktail Lounge. On the edge of Chinatown, at the mouth of False Creek, Science World at TELUS World of Science is housed in a distinctive golf ball-shaped building that makes it easy to spot from the nearby Main Street SkyTrain station. Home to educational exhibits that make science fun for all, the family-friendly attraction also runs “After Dark” adults-only evenings for anyone over 19 who wants to explore the exhibits while also enjoying a glass of wine or beer. False Creek Ferries and the rainbow-colored Aquabuses run from Science World to various points along the inlet such as Yaletown and Granville Island. Hop on the small ferry or take a bus to reach the bustling food market on Granville Island, which sells everything from salads and sushi to pizza and pies. While you’re there, head to Railspur Alley to taste local tipples such as sake at the Artisan Sake Maker or pink gin and other craft spirits at Long Table Distilling. Catch a comedy show or musical at one of the theaters and improv centers, and enjoy local seafood for dinner at The Sandbar Restaurant and Edible Canada. Nightlife in Downtown Vancouver is centered on Granville Street, known generally as the Granville Entertainment District. Stretching, roughly, from Nelson Street to Robson Street, downtown Granville Street is packed with bars and nightclubs, making it easy to club-hop from one destination to another. Big-name DJs and dance acts often perform along the strip and legendary venues such as the Vogue Theatre and Commodore Ballroom host touring live bands. Reach Yaletown's restaurant and dining district by taking the Canada Line to Yaletown-Roundhouse Station. Yaletown is one of Vancouver's trendiest neighborhoods and is famous for its dining and nightlife. Dress to impress and head to OPUS Bar; you may even spot a celebrity. Yaletown’s converted warehouses are home to a wide range of restaurants from vegan eateries like MeeT to chains such as The Keg Steakhouse (worth a look for the hidden rooftop bar). The neighborhood is also home to a concentration of some of the city’s best seafood restaurants, from the Aburi sushi of Minami to fresh fish at WildTale Grill and Ocean Wise sustainable seafood at Blue Water Café; all can be found within a two-block radius of each other. Home to beautiful people, Yaletown is the place to head for an urban spa experience. Discover local skincare brand and spa Skoah on Hamilton Street, or head to Float Yaletown on Cambie Street to relax in a flotation tank and leave the city far behind. If blowouts and brows are your thing, Mainland Street is home to the Indian-inspired Bombay Brows and Blo Blow Dry Bar. Davie Street runs from Yaletown’s waterfront to English Bay in the West End and is home to Vancouver's best LGBT nightlife. Party at a drag show at Celebrities nightclub or The Junction, live it up at The Pumpjack Pub or go more low-key at 1181’s lounge. Recover the next day with a crazy Caesar cocktail (a Canadian twist on a Bloody Mary that features Clamato juice) on the patio at The Score on Davie—the extreme beverages come with everything from a burger and wings to chocolate brownies on top. The West End and Coal Harbour are the neighborhoods west of Downtown Vancouver, toward Stanley Park. There is no rapid transit to the West End; you can walk or bike the Seawall, drive, or take a bus. Downtown Vancouver’s most popular beach is at the entrance to Stanley Park, at the bottom of Davie and Denman streets. Summertime sees it bustling with tourists, especially during July and August when the annual Celebration of Light international fireworks competition lights up the night with epic displays. Rent a kayak or stand up paddleboard to explore the coast or hit the beach at dusk to see spectacular sunsets over Vancouver Island on the horizon. It’s possible to walk, cycle, or rollerblade the 8.8 kilometer (5.5 mile) seawall that stretches around the huge park but for visitors with limited time, Vancouver’s most well-known landmark is best seen by bike. Rent one (or try a tandem if there’s two of you) from one of several rental places along Denman—Spokes Bicycle Rentals is closest to the Coal Harbour end of the seawall and English Bay Bike Rentals on Davie Street is nearest to English Bay. Observe the one-way system to start near the rowing club and cycle around the seawall, passing stunning views, back to Canada Place and the downtown skyline, as well as the North Shore mountains, Lions Gate Bridge and Kitsilano. Stop at Third Beach for photo opportunities of the ocean, mountains, and forest, or take one of the internal trails to discover the lakes and forests of Stanley Park. There’s plenty to do in Stanley Park —from checking out the totem poles to taking a horse-drawn carriage ride—but the Vancouver Aquarium is one of the city’s best-loved attractions. Exhibits at the non-profit center include sea lions at Steller’s Bay and an interactive experience called Discover Rays. Get hands-on in the Wet Lab, explore the Tropic Zone, and learn more about the Pacific’s inhabitants. Head to an After Hours event to explore the exhibits in an adults-only setting and enjoy a glass of wine whilst learning more about the sea creatures that call the local ocean home. Look for "Ocean Wise" menus at restaurants around Vancouver—the Aquarium started the concept to promote sustainable seafood. Close to the Coal Harbour entry point to Stanley Park, Robson, and Denman Streets are home to some of the city’s most popular ramen and Korean restaurants. Eat Korean fried chicken at Zabu or choose from one of the many ramen joints to warm up with a bowl of Japanese noodles on a rainy day. Prepare for lines at popular places such as Hokkaido Ramen Santouka, Marutama Ramen, Ramen Danbo, and Kintaro. Walk up Robson Street, or take the parallel Alberni Street, to discover Vancouver’s version of Rodeo Drive and a golden mile of high-end hotels such as the Shangri-La Hotel, Fairmont Vancouver and Trump International Hotel & Tower. Home to Tiffany & Co.’s flagship store, the 1000 block of Alberni also has De Beers, Dior, Gucci, Louis Vuitton, Hermes, and Burberry stores. Shop for high-end luxury brands and look out for Lamborghinis while you indulge in some Alberni Street luxury shopping.